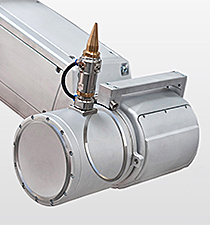 As the number of robot installations continue to grow, more designers than ever are specifying Kaydon bearings. Lighter-weight robots are able to maximize payload and reduce inertia, improving response and optimizing power requirements, and the use of compact components allows them to meet stringent space requirements. Kaydon Reali-Slim® bearings deliver both advantages: a Reali-Slim KA020CP0, for example, reduces weight by 83% and space by 85% compared to a standard 6010 ball bearing. Reali-Slim bearings feature a constant cross-section regardless of bore diameter while providing precision and plenty of dynamic capacity. Reali-Slim Type X four-point bearings—which accept combined radial, thrust and overturning moment loads—simplify a robot's overall design by replacing a pair of angular contact bearings with one. For the best combination of low torque and high stiffness, Kaydon offers duplex pairs, preloaded to eliminate the need for shimming. Kaydon Super Duplex bearings feature a single common race (either outer or inner) and two ball paths for applications requiring even greater stiffness. Kaydon cartridge bearings go a step further, with a single inner race and single outer race for optimal torque performance. Kaydon thin section bearings are available from stock in over 425 sizes and configurations. 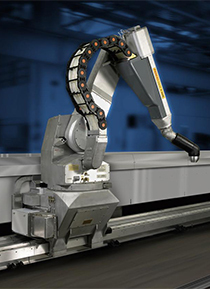 Popular options for robotic applications include stainless steel and special lubrication for vacuum conditions. Kaydon slewing ring bearings are commonly used for a six-axis robot's first axis sometimes called the waist, which has to support the entire robot structure, arm and payload. Kaydon slewing ring bearings deliver excellent rotational accuracy, load capacity, and long life, with integral configurations (mounting bolt holes, seals, gearing, etc.) that can lead to significant savings in materials and assembly. Kaydon's Reali-Slim TT® series includes the first small-scale, thin section turntable bearings designed for demanding applications including robotics. Reali-Slim TT series turntable bearings save weight, reduce product design envelope sizes, and increase design flexibility. Reali-Slim TT bearings offer significant advantages vs. conventional slewing ring bearings, including smaller size, improved accuracy, and fast installation and change-out. 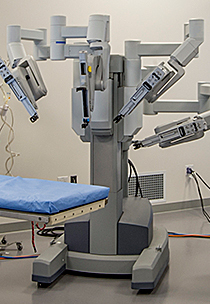 A leading global producer of high-precision bearings and high-level bearing assemblies, Kaydon also offer comprehensive engineering and technical support that includes expertise in a wide range of robotic applications.